Remember a few posts ago when Kate asked what your ultimate fall food was? The one you just absolutely HAVE to make when the leaves start turning? The one that says, “Fall is here and I want to savor every second of it” ? And it wins by a landslide. Just look. And click on that picture so you can see every last drip. Now if you haven’t noticed, Kate and I are practical girls. We have a little formula that we live by in our culinary world. It’s kind of a work required + tastiness = ultimate payoff kind of thing. In other words, if something requires a significant amount of work, it better be really good. And if we can find an easier/faster/more cost effective way to do the same thing, and have it taste just as good, you better believe we’re going to take the easy road. So take my ice cream sandwiches. When I first came up with these I made soft, homemade gingerbread cookies, homemade caramel, and this fabulous pumpkin ice cream from Williams-Sonoma. They are to die for. But also a lot of work. I will say that the pumpkin ice cream is fantastic, and worth the effort if you’ve got the time. I highly recommend you try it if you’re up for it. But I also figured I could come up with a mucheasier version of the whole sandwich that would taste just as great. Mission accomplished. I came up with a great no-cook super easy Pumpkin Spice Ice Cream. (It’s great with any fall dessert). Instead of homemade gingerbread, I used cake mix cookies, which I actually like much better than the gingerbread. This time of year you can also get the refrigerated pre-made roll of Pillsbury gingerbread cookie dough and that would work too. Lastly, these spice cookies would be awesome as well. I haven’t tried it with those ones yet, but I’m dying to. Jarred caramel sauce finishes it off. I’m telling you- this is E-A-S-Y! Follow instructions for Cake Mix cookies, using a “Spice Cake” flavored mix. Use a cookie scoop so you make sure to get uniform cookies. Before cooking, use the bottom of a glass sprayed with cooking spray to flatten the cookies (they’ll be better frozen if you flatten them). Under cook them. This is important! You want them very soft, otherwise they’ll get rock hard in the freezer. Cold crunchy cookies are not good. Frozen, soft, doughy cookies? Good. Place brown sugar, cinnamon, ginger, and nutmeg in a mixing bowl. Stir with a whisk to combine. Add pumpkin and whisk together. Add cream, milk and vanilla. Stir with a whisk until everything is well distributed and brown sugar is mostly dissolved. For best results, chill mixture in the fridge for several hours and then process in ice cream maker according to manufacturers instructions. Transfer ice cream to an airtight container and freeze several hours, or overnight, until firm. Preheat oven to 350. Beat all ingredients together until well combined. Roll about a tablespoon of dough into a ball and place on a parchment lined cookie sheet. Bake for 5-7 minutes or until just barely set on edges. For ice cream sandwiches cookies are best slightly underdone. Let cookies cool on baking sheet for 2-3 minutes and use a metal spatula to transfer them to a cooling rack. Cool completely and then fill with ice cream, or crumble over bowls of ice cream drizzled with caramel sauce. Okay, making ice cream sandwiches is a fine art. I know you’re thinking I’m nuts because how hard is it to put some ice cream between 2 cookies?? Hard enough that people mess it up all the time. Ya, I’m talking to you- the one who had crunchy cookies that when frozen almost broke my front tooth. Or maybe I’m talking to you- the one who had super soft ice cream so when I bit down on the cookies it all smooshed out. Or perhaps you- the one with a too high cookie-to-ice cream-ratio, which made the ice cream liquid before the cookies were thawed enough to bite through. The perfect ice cream sandwich needs to have the perfect balance of the perfect consistency of both the cookie and the ice cream. Making these ahead takes a little more effort, but the extra steps help with a great finished product. 1. Make your cookies. The most important step is to under cook the cookies. More undercooked than you think you want them. Even if they’re “doughy” they’ll be a great consistency when frozen. Cook them so they’re just done around the edges. 2. Let them cool completely and then pop them in the freezer for a bit to help them firm up. This way, they won’t fall apart when you’re smashing your sandwiches together. 3. Make your ice cream and place it in the freezer to harden. Don’t let it freeze all the way, just a couple of hours or until it’s a good scooping consistency, but still soft enough to smash. And if you do end up freezing your ice cream all the way, that’s really okay too. Just let it sit at room temp until it’s soft enough to scoop. 4. 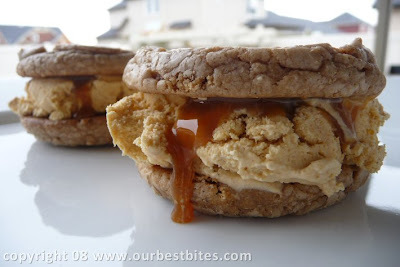 Take your cookies and place a spoonful of jarred caramel sauce on each cookie. Don’t spread it around. It will spread on its own when you smash the cookie together. 6. Place on a plate/cookie sheet/whatever in a single layer and place in the freezer immediately. If you’re making a bunch of sandwiches, put them in the freezer as you go so they don’t melt on your counter! Wait until they harden completely (overnight) before putting them in an air tight container or ziplock bag. When you want to eat them, just let them sit at room temp for about 5 minutes to let them soften a bit and they’ll be perfect! I too am obsessed with the pumpkin thing! I have made two different batches of pumpkin bars already this month. I am craving pumpkin cookies, they are next! I do enjoy pumpkin pie, homemade only though! NOT store bought! Oooohh! Sounds so good! I’m iffy on pumpkin stuff. Don’t love it, don’t hate it. I have had some delicious pumpkin deserts before, however. Am I a local? I’m guessing not- Idaho? Hey! Where is “local”? Chicago? Then I’m local! Local, AND I’m not crazy, can’t beat that right? And how did I know that Jeni would sneak in the first comment?? You’re such a little night owl Jeni! I’m guessing you want the ice cream, even though you didn’t say it. You better put it in writing unless you want to fight for it! lol. Christina- I know a lot of people who like some pumpkin stuff, but not other stuff. Ever had pumpkin ice cream? Amber- I wish Chicago was local, I love it there! My brother and SIL lived there during law school so I got out there to visit. Cool place! Dang it. Move to Utah, will you! I want in on the ice cream. I like pumpkin pie fine, but it’s not the flavor of pie that I choose if there are others tempting me (like caramel pecan). But any other baked good with pumpkin in it? I’m all over it. Yes, it pays to stay up late sometimes! I DO want the yummy pumpkin ice cream! I am a pumpkin Lover! and that includes pumpkin pie (ya, I think you are weird) Anyway, you’ve ruined my whole day because now…these are all I can think about! I will not be satisfied until I’m sinking my teeth into one. I’m going to the store right now! Thanks for the recipe. Is Idaho Falls local enough? Why why why why why???? I decided on Sunday that I was going on a strict low carb diet for the next two weeks before vacation. I come here and see THESE?! It’s a good thing I am not in Idaho because that ice cream would never make it to the lucky winner! And no you are not weird for not liking pumpkin pie, but you are VERY weird for not liking mom’s pumpkin pie- I LOVE that stuff! I want to see my favorite meal from Fall Fest on here- Dinner in a pumpkin! These look heavenly! What a temptation to go and make some!! shoot, I really wanted that ice cream! I guess I will just have to make it myself. This looks sooooo good! I think I’m going to have to invite myself over to Jenny’s house to enjoy that ice cream! Those sandwiches look amazing and I know my husband would love them, I’ll have to try it! Crap, always a day late and a dollar short!! These look amazing. I don’t like pumpkin pie either but I love all other pumpkin concoctions, the problem is my husand loves pumpkin pie but doesn’t like anything else with pumpkin. . . solve that dilemma will ya!? I die! I usually just lurk here, but I have to speak up because these look DIVINE. I can’t wait to try them. And, yes, I love pumpkin pie so much that I make them year-round. I’ll make two at a time, and then my kids and I eat them for breakfast. So healthy, I know. I’m with you–I don’t like pumpkin pie, but LOVE anything else pumpkin–cookies, bread, smoothies (I was so sad when Jamba Juice discontinued their seasonal pumpkin smoothie), muffins, cheesecake, etc. This ice cream looks really good. If you have anymore pumpkin recipes, please share! Oh my gosh, yummy! I can’t wait to try this out! I’m going to try this with Soy Milk. My son is lactose intolerant, and I’m Vegan – but I think we can put together a tasty version of this – I’ll let you know. I just made this recipe this weekend and it was FANTASTIC! Thanks! I made the pumpkin ice cream and it is so creamy and flavorful. The best pumpkin ice cream I have ever tasted. This has become a quick favorite!! Will you clarify the recipe for me? The line that says “3/4 tsp C Brown Sugar” is a wee bit confusing. P.S. I was talking with a friend of mine the other day. She asked if I had heard of “My Best Bites.” I corrected her and said it was “Our Best Bites” and yes, I knew them very well! She said she could always count on your recipes to turn out wonderfully. I was pleased to hear her rave reviews for you guys! Thought I’d pass that along.